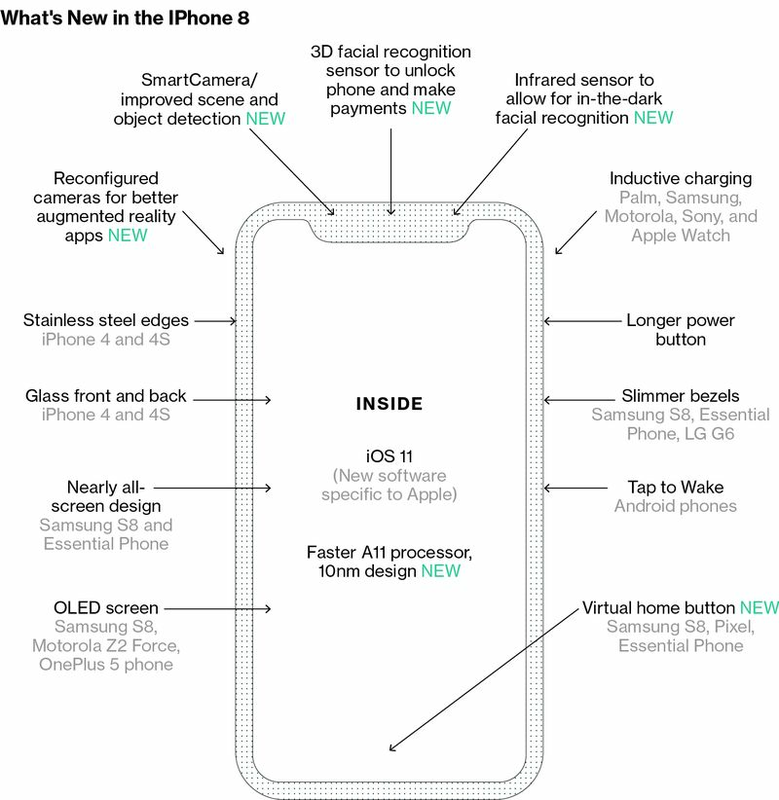 Apple Inc. plans to transform the way people use its next high-end iPhone by eliminating the concept of a home button and making other adjustments to a flagship device that’s becoming almost all screen, according to images of the new device viewed by Bloomberg News and people familiar with the gadget. The home button is the key to the iPhone and the design hasn’t changed much since it launched in 2007. Currently, users click it to return to the starting app grid that greets them multiple times a day. They hold it down to talk to the Siri digital assistant. Double click it and you get multitasking where different apps screens can be swiped through like a carousel. Apple is preparing three new iPhones for debut next month. One of the models, a new high-end device, packs in enough changes to make it one of the biggest iPhone updates in the product’s decade-long history. With a crisper screen that takes up nearly the entire front, Apple has tested the complete removal of the home button—even a digital one—in favor of new gesture controls for tasks like going to the main app grid and opening multitasking, according to the people and the images. In the new, high-end iPhone, Apple also plans a taller screen with rounded corners, a cutout at the top of the display for the camera and sensors, and new antenna locations, the images show. Apple often tests different designs and the details may differ from what the company ultimately releases. An Apple spokeswoman declined to comment. The new model’s overall size will be similar to that of the iPhone 7, but it will include an OLED screen that is slightly larger than the one on the iPhone 7 Plus (5.5-inches), people familiar with the product have told Bloomberg News. The phone will have symmetrical, slim bezels around the entirety of the screen, meaning the area below the screen that used to house the home button and the area above the screen for the earpiece have been removed. The earpiece, facial recognition sensor, and selfie camera are instead present in a cutout, or “notch,” at the top of the screen, the images show. The new screen is rounded on the corners, while current iPhone screens have square corners. The power button on the right side of phone is longer so it is easier to press while holding the device in one hand, according to the images and the people. The color reproduction of the OLED screen means that when the display shows black, it blends in nearly perfectly with the phone’s notch and thin black edges on the front, presenting a seamless look, according to the people familiar with the product. The screen itself, however, is flat like current and past iPhones and lacks the fully curved displays of the latest Samsung phones. Apple also plans to include a stainless steel band around the phone which the glass curves into. The steel band has small antenna cuts on the corners like past iPhones to improve reception, the images show. Apple previously used steel sides and a glass casing for the iPhone 4 and 4s before moving to a mostly metal back and sides with the iPhone 5. The iPhone 6 line and newer have had completely metal backs.